Remote collaborative brain linking, networks of rat brains solving problems, mind-swapping ... what's going on here? Researchers have electronically linked the brains of pairs of rats for the first time, enabling them to communicate directly to solve simple behavioral puzzles. They even brain-linked two animals thousands of miles apart — one in Durham, North Carolina and one in Natal, Brazil. “Our previous studies with brain-machine interfaces had convinced us that the brain was much more plastic than we had thought,” said Duke University Medical Center neurobiologist Miguel Nicolelis . “In those experiments, the brain was able to adapt easily to accept input from devices outside the body and even learn how to process invisible infrared light generated by an artificial sensor. To find out, the researchers first trained pairs of rats to solve a simple problem — to press the correct lever when an indicator light above the lever switched on, to obtain a sip of water. 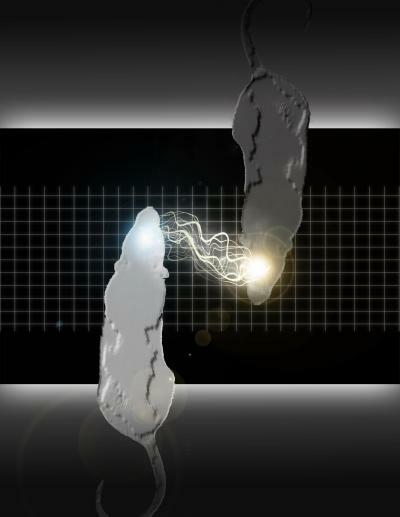 They next connected the two animals’ brains via arrays of microelectrodes inserted into the area of the cortex that processes touch information. One animal of the dyad was designated as the “encoder” animal. This animal received a visual cue that informed it which lever to press in exchange for a food pellet. Once this “encoder” rat pressed the right lever, a sample of its brain activity that coded its behavioral decision was translated into a pattern of electrical stimulation that was delivered directly into the brain of the second animal of the dyad, known as the “decoder” animal. The decoder rat had the same types of levers in its chamber, but it did not receive any visual cue indicating which lever it should press to obtain a reward. So to press the correct lever and receive the reward it craved, the decoder rat would have to rely on the cue transmitted from the encoder via the brain-to-brain machine interface. The researchers then conducted trials to determine how well the decoder animal could decipher the brain input from the encoder rat to choose the correct lever. The decoder rat ultimately achieved a maximum success rate of about 70 percent, only slightly below the possible maximum success rate of 78 percent that the researchers had theorized was achievable. This maximum rate was what the researchers found they could achieve when they were transmitting regular electrical signals directly to the decoder rat’s brain that were not generated by the encoder. Importantly, the communication provided by this brain-to-brain interface (BTBI) was two-way. For instance, the encoder rat did not receive a full reward if the decoder rat made a wrong choice — a “behavioral collaboration” between the pair of rats. “We saw that when the decoder rat committed an error, the encoder basically changed both its brain function and behavior to make it easier for its partner to get it right,” Nicolelis said. “The encoder improved the signal-to-noise ratio of its brain activity that represented the decision, so the signal became cleaner and easier to detect. And it made a quicker, cleaner decision to choose the correct lever to press. 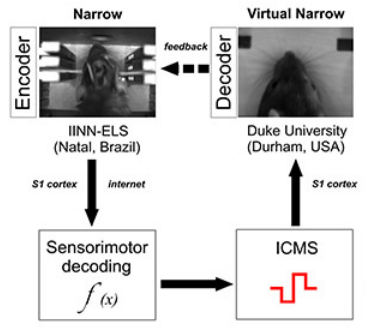 To test the transmission limits of the brain-to-brain communication, the researchers placed an encoder rat in Brazil, at the Edmond and Lily Safra International Institute of Neuroscience of Natal (ELS-IINN), and transmitted its brain signals over the Internet to a decoder rat in Durham, North Carolina. They found that the two rats could still work together on the tactile discrimination task. Nicolelis concluded that “These experiments showed that we have established a sophisticated, direct communication linkage between brains, and that the decoder brain is working as a pattern-recognition device. So basically, we are creating what I call an organic computer. Such a computer solves a puzzle in a ‘non-Turing’ way,” he said. A “Turing machine” is the classical model for a computer, in which a computer operates on data using a set of predetermined instructions — also known as an algorithm — to arrive at a solution. Nicolelis pointed out that, in theory, such a system is not limited to a pair of brains, but instead could include a network of brains, which he named a “brain-net.” Researchers at Duke and at the ELS-IINN are now working on experiments to link multiple animals cooperatively to solve more complex behavioral tasks. Nicolelis first introduced the concept of a “brain-net” in his book Beyond Boundaries: The New Neuroscience of Connecting Brains with Machines — and How it Will Change Our Lives. “We cannot even predict what kinds of emergent properties would appear when animals begin interacting as part of a brain-net. In theory, you could imagine that a combination of brains could provide solutions that individual brains cannot achieve by themselves.” Such a connection might even mean that one animal would incorporate another’s sense of “self,” he said. This was suggested in a second set of experiments in which the researchers trained pairs of rats to distinguish between a narrow or wide opening using their whiskers. “Our studies of the sensory cortex of the decoder rats in these experiments showed that the decoder’s brain began to represent in its tactile cortex not only its own whiskers, but the encoder rat’s whiskers, too. Basic studies of such adaptations could lead to a new field that Nicolelis calls the “neurophysiology of social interaction.” “To understand social interaction, we could record from animals’ brains while they are socializing and analyze how their brains adapt — for example when a new member of the colony is introduced,” he said. Such complex experiments will be enabled by the laboratory’s ability, announced last December, to record brain signals from almost 2,000 brain cells at once, an unprecedented number said Nicolelis. Ultimately, the researchers hope to record the electrical activity produced simultaneously by 10–30,000 cortical neurons in the next five years — which could be useful for the Brain Activity Map project. Such massive brain recordings will enable more precise control of motor neuroprostheses — such as those being developed by the Walk Again Project — to restore motor control to paralyzed people, Nicolelis said. This projefct recently received a $20 million grant from FINEP, a Brazilian research funding agency, to allow the development of the first brain-controlled whole-body exoskeleton aimed at restoring mobility in severely paralyzed patients. A first demonstration of this technology is expected to happen in the opening game of the 2014 Soccer World Cup in Brazil. Nicolelis and colleagues published their findings in the February 28, 2013, issue of the open-access journal Scientific Reports. Nicolelis is a professor of neurobiology, biomedical engineering, and psychology and neuroscience, and co-director of the Center for Neuroengineering. More information: Nicolelis Lab. A Brain-to-Brain Interface for Real-Time Sharing of Sensorimotor Information. The movie sequence depicts a dyad of rats transferring cortical motor information via the brain-to-brain interface. The yellow circle indicates the correct choice in each behavioral chamber. The audio track is the spiking activity of an ensemble of M1 neurons. Immediately after the encoder’s reward, a pattern of ICMS is delivered to the decoder rat’s primary motor cortex. Note that, after the decoder makes a correct lever response, the encoder rat is rewarded for the second time during the course of a single trial.